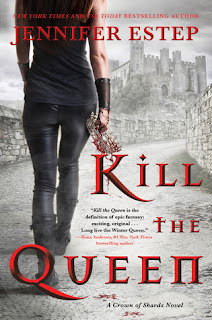 Kill the Queen is book 1 in the Crown of Shards series. I love Jennifer Estep's books so I knew this would be a must read for me! If you've read her books before, this one is a bit different from the rest, it's an Epic Fantasy instead of Urban Fantasy, but is still full of magic and action. Lady Everleigh Blair is seventeenth in line for the throne, and learned a long time ago to try to remain in the shadows at court. We get a glimpse of her daily life before the massacre happens. Her cousin, Vasilia, the crown princess decides to take matters into her own hands and kill off everyone in the Blair line so she can be Queen. Everleigh is the only one that manages to escape due to her immunity to magic. She makes her way to a gladiator troupe and gets taken in as a new recruit. No one knows her real identity and she isn't sure who she can trust so it has to stay that way. She changes her name to Evie and chops her hair and tries her best to become a gladiator. Someone has to reveal what really happened that night and Evie is going to have to step forward before Vasilia brings war to Bellona. Kill the Queen is a great start to a new series. The characters were well done, I hated Vasilia and was rooting for Evie. There were a few that intrigued me and I hope we find out more of their back stories in the next book. Evie was a bit reckless, she has to live so she can stop Vasilia but some of the events that happened could have went the other way easily. All in all, this was a great adventure and I can't wait to see what happens in the next installment. If you're a fan of Epic Fantasy novels you should give this book a try.